Pete Squires has been formally licensed by Bishop Donald as Giving Officer for the Diocese of Peterborough. The licensing took place on Wednesday 25 July at Bouverie Court during its weekly 12pm Eucharist service, which enabled the whole Bouverie team to join in and witness the occasion. 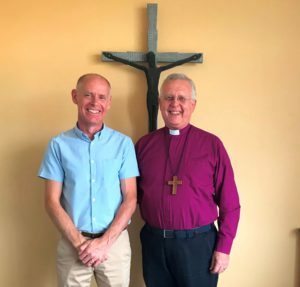 Pete will be working with Paul Adams – the Stewardship and Funding Officer for the Diocese of Peterborough – to provide encouragement, resources and hands-on Stewardship expertise to parishes. It’s an appointment that Richard firmly believes will be a huge benefit to the diocese as a whole. Pete is thrilled to be working for the Diocese of Peterborough. Asked about his feelings, he quoted Matthew 9:37 – “Then he said to his disciples, ‘The harvest is plentiful but the workers are few'” – and simply said “I’m just another worker reaching out for his Kingdom”.